(CNS): Activists protesting the proposal to relocate Grand Cayman’s landfill from the capital to the eastern district of Bodden Town have been ignored by the overseas territories minister so they are taking their complaint to the Foreign Affairs Committee. The group wrote to the FCO's minister, Mark Simmonds, in November about the Cayman government’s proposal to enter into a deal with Dart to move the landfill, but they have not even received a letter of acknowledgment. Leaders of the Coalition to Keep BT Dump Free have launched an appeal to the UK’s Foreign Affairs Committee (FAC) asking for its urgent intervention. The activists believe that the UK is being inconsistent regarding its position on good governance and the rule of law in the Cayman Islands and the leaders of the Coalition to Keep BT Dump Free are asking the UK’s Foreign Affairs Committee (FAC), which is a bi-partisan non-government parliamentary committee, to examine the situation in relation to the Dart deal and how it relates to the UK government’s own insistence on good governance and the recent adoption of the Framework for Fiscal Responsibility (FFR) into local legislation. The UK government recently forced the former UDP administration to stop negotiations with China Harbour Engineering Company over the cruise port development in George Town until the process had been properly tendered. However, the governor here and the UK appear not to have any concerns about the elements of the ForCayman Investment Alliance deal, even though the project has not gone through the usual process. The coalition has suggested that the FCO’s reluctance to apply the rule of law to the agreement, and in particular to Dart’s proposed deal to move the George Town (GT) dump to the Midland Acres site, suggests the FFR does not apply to the rich and powerful. Alain Beiner, chairman of the Bodden Town Coalition, said it was scandalous that the UK appears to consider Dart and any project it promotes to be above the law. Both the governor and the FCO have stated that because a “swap” of assets is involved in the dump deal, the provisions of the FFR may not apply. Beiner said the unambiguous rejection of the Dart proposal by the Central Tenders Committee (CTC) in December 2010 illustrates the point that Simmonds was making to McKeeva Bush in November last year when he warned of the risks of not following the proper procurement processes. While the CTC had rated the Dart dump proposal as the worst of all tenders considered, expressing concern about the environmental impact during a proper tendering process, Beiner was puzzled why Simmonds was now choosing to ignore the CTC’s deliberations and recommendations. His coalition colleague Gregg Anderson said the divestiture of crown land or public assets, whether sold, “swapped” or even given away, should be done through an open tendering process to establish the true value. “How else can the people know if our government is not trading gold for onions, particularly since many here feel that the ‘swap’ and the dump deal only benefit Dart?” askedAnderson. Coalition leaders are convinced that the reluctance to ensure good governance and the rule of law in Cayman mirrors recent events in the Turks and Caicos Islands, where the governor and the FCO failed in their responsibilities. But the leaders are concerned that the sums of money involved in questionable public projects and divestitures in Cayman could outstrip the alleged criminal transactions in the TCI exposed after the intervention of the Foreign Affairs Committee. “Far more serious than anything uncovered in the TCI, the contingent liability from Dart’s dump deal is staggering in terms of potential material, health and environmental damage,” Anderson added. Midland Acres resident Arlene Whittaker, another coalition leader, said the FFR requires that major public projects such as the proposed dump move are subject to due process to secure best value for money and to allow all local firms the opportunity of bidding. Clifford added that the Coalition was hoping for an urgent response from the FAC because the people of Cayman were counting on its involvement to help ensure a similar degree of good governance and the rule of law as the people in the UK. Maybe we should move it to Bodden Town rather than the proposal to locate it quite a distance from Bodden Town, because let's face it Bodden Town is already a dump. Ladies and gentlemen, This issue is not for the UK to fix. This issue is for us to fix. The next members of the new gov't will have to do the right thing. Value for money and the environment. I put a question last year to the gov't on a special that Tammie Sulliman aired on the news.Showing pictures that a man from Fla. sent me. Showing improper disposal techniques of medical waste that was radioactive. Their half lifes was different only the hospital could tell you or the internet . What that means is that certain materials become inactive at different times. Some hours ,some weeks ,some months some years. They were to be buried in the ground in a thick heavy liner. That hasn't been done yet. They put them behind chain link fences. What would be the purpose of putting it in the central mangrove on or near aquifers that are being used by residents to water their plants and vegetables or their cows? Years ago when Ezzard was the health minister I questioned him about different ways to save money for us . One of the subjects he spoke about is that we needed to address the dump. I asked what do you suggest and he said we need to do the same thing as the states and recycle. Why haven't we ever suggest that ? The country is looking for revenue. Here is another idea . Lets slowly take down the mountain and send it out of the country instead of making another mountain and toxic land somewhere else. People have been talking that they want to save the environment. Well the central mangrove is where the most pristine 10,000 acres of land can be found . Why destroy that land there? Wouldn't all the quarries then get toxic also? The wind and sea comes from the east that means the current of water is also moving from east to west. That means if you bury garbage (toxic) it will evenually go west with the flow of water . Then all the quarries will be moving waste water in the marl they sell all over the island. I hope you see now its a bad idea . If it was already west, it would be a better idea for all people living in Cayman if it stays somewhere west. If you think I'm wrong then put a color dye in midland acres and see the dye cross over to other quarries. Wait a minute, you wanted all this self-governance. Now you realise how badly that is working out for you, youi go running to the FCO when it is no longer their business. Most of the blogs want the current dump to be moved for various reasons and the one that makes me chuckle is let’s move the dump before the tourist moves there business. Funny it’s not ok for the dump to be an eyesore to a couple of tourist . However, it’s ok to poison the ground in a neighborhood where there’s family homes with children. Lets get the record straight if and when the dump moves to Bodden town dart has already indicated he will hand the keys over to our government. It is not going to be a waste to energy site nor a recycling center it will be a dump and when all the ground water is contaminated and the majority of us continue to die from cancer lets hope then dart has an hospital to facilitate all the cases. Before the UDP took over, there was a company that wanted to recycle the existing garbage but because of politics it did not materialized. In my opinion the best suitable place for the dump is in Barkers west bay. These are my reasons: Dart already owns the land, there are dual carriage ways to the site, most of the garbage is from George Town and west bay so the site would be closer, theres no thorough way past barkers so no one will see it or smell it and there’s no water lense or wetlands to be concerned about. I really do not support any political group because they are all a waste of time and it is because of all of them including the financiers of UDP (c4c) why we are in this mess. If we were to put aside politics, money and dart the best place is to leave it where it is and start recycling and converting waste to energy and if this can not be done then west bay is the best place. Don't blame the FCO or Dart. Let's be clear, the past decades of politicians (both UDP & PPM) let this problem GROW and did nothing about it. We need a decent waste facility and to get rid of the huge SMB landfill, period. When cruise ship passengers started taking photos and the smell started running tourists off SMB beach, our politicians ignored the problem and built massive schools, (instead of fixing the education literacy problem) spent our money on foolish endeavours and went into huge debt. We DO need an expert outside opinion and whatever the experts recommend, we follow. Stop making this a political football and just take care of the problem! We all know that photo was taken with a telephoto lens and the real view is nothing like that. The biggest problems are that no one trusts our own government to run a proper waste facility and that Dart doesnt want to run it – it just wants it out of his backyard. The dump should be remediated on-site or a new site with proper management.. Moving the problem to a residential/agricultural area is no solution. You sir, are a complete idiot. Sorry, no offence, but it really had to be said. The Dump in GT is the best place for it! The pile of garbage is not moving but another pile of garbage is proposed to be created on another site!! Why create another dump in a middle class area when the rich have the money to deal with it where it is instead of spending all this money create another site. The Dump is a gold mine ask any recycling company!! I am going to tell you that these middle class folks in BT will not sit back and let the Rich dump on us so they could get richer! If the Dump is such a gold mine where are all the other offers to fix it at no cost….Also it's not the responsibility of rich folks to fix a problem created by you..
Did you read the tenders? If so, you would have found there was at least one I believe. Where do Fosters have a container for waste plastics? Don’t bring such silly things in the discussion. Some very rich people live in bodden town and dome very poor people live in george town. Why should we George Towners take your bodden town garbage down here? I say make it simple…. a dump in each district to deal with your own garbage. Indeed 09.54. They have wanted to control a dump for years, it has been their dream, they wake up early in excitement each day thinking just how much they could do today to control Caymans dump which Cayman itself appears incapable of dealing with. BTW, moving to BT was a Cayman idea, wasn't it? Why would the FCO comment? That would be control of a Caymanian decision. Get real, for goodness sake. UK has enough rubbish of its own, it does not need yours. It is sad that there are so many who haven't studied the history of British colonialism. I am shock of the thumbs downs. Thank God for British Colonialism…Law and Order, Judiciary, system of Government, education, Civil service…you think all that you take for granted in our everyday lives happened by accident….? Cayman is so irrelevant I can assure you it does not make it onto the FCO global agenda. 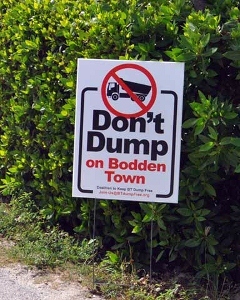 Don't want the dump in Bodden Town? Where do you want it? THE GEORGE TOWN DUMP IS OUT OF CONTROL – jokingly called Mount Trashmore – Though it's not a joke. Where else do you naysayers want to put the dump? Better ideas? Get a grip – the planned spot is the best and only place. I think it's high time that the George Towners get up in arms and fight for this dump move. Not only will this create a proper waste management facility in Bodden Town, but the GT landfill will become a really nice place to have for everyone. In my opinion these Bodden Towners are being very selfish. Let's start picketing too GTpeople and make this happen! Under the current "plan" it WILL NOT create a proper waste management facility; all it will do is create three lined open pits. After that, it will be turned over to the CIG, who presumably continue to mismanage the new facility by hauling Trashmore over there. instead of actually dealing with the problem in an environmentally-sound manner — mitigation on site and recycling. We'd better get this right and now be swayed by shiny trinkets flashed in front of our eyes for short-term gain. it will NOT create a 'waste management facility'. Under the current proposal, it will created three lined open pits. So, then we get two environmental hazards for the price of one. Real smart. I don't understand for the life of me why some of us think that trucking our dump to another site is a good idea; think about it……. not mitigating it on-site (in situ), not really getting going with recycling, but actually trucking Trashmore to another site — three open pits. Dart doesn't want to pay for trucking the trash. He doesn't want to pay for a waste management facility or anything other that three pits and CIG has to pay for the rest. Terrible deal, that will cost us all more to deal with our trash as an extra added bonus. Trucking Trashmore. Sounds like a documentary in the making……. or perhaps a punk band. Yup they want to truck that trash to yet another lined dump (not an improved facility at all in truth) and then they'll want to truck it all the way back to town again for the recyclable elements to be shipped out. Like that makes sense… not! And how does anybody know "its the best place" if no surveys have been done and no consideration given to anywhere else? Do you live near Mount Trashmore? If you do and you find it so offensive – why did you choose to live in the vicinity and thendecide you wanted the dump to move? ''And how does anybody know its the best place"
CNS – Is there a way to post a picture? Because obviously this person has not seen the dump from the eyes of our cruise ship visitors. It's a mountain – a massive mountain – that reeks throughout SMB and GT. Read the reports CNS published several weeks ago – the BT location will have the least amount of impact. Once upon a time the current location might have work, you know, before the islands population reached 20 thousand. And before Hurricane Ivan meant that so much extra waste was piled on top of it. So creating an additional out-of-control mismanaged open pit is a solution? Yeah, sure, but a solution for whom? Not us, the Caymanian people. We have to study and figure out a way of handling our own waste, and mitigate Trashmore in-situ. Hiding it isn't going to be a viable long-term solution. When will people learn that the Foreign and Commonwealth Office is all about Her Majesty's Interest and keeping the Territories under Her control ?! No more ! If you want Cayman Interest to be acknowledged, you people have to get help somewhere else ! The FCO is currently operating what appears to be an NIH (not invented here) policy on the Cayman Islands. They don't want to know about anything that doesn't come out of their own offices. Mark Simmonds in particular appears to be trying to isolate himself from everything that is going on. It's a bit like he thinks it's all dirty and some of it might rub off on him. 3. Monitor govenrance and move towards transparency and make sure government does not steal so much that the UK has to bail Cayman out as it did TCI. That has been the way since 1962. Except that whenever UK does or fulfils one of its obligations it is a "colonial power" plotting against the Cayman masses. Or in Mac's case, "interfering" so he can't steal as much and driving Cayman towards transparency. The rest is up to Cayman and the Government Caymanians elect. If you cannot elect proper honest and competent people, that is your issue- to the extent that the UK will not allow Cayman to go bankrupt as a result. But now you want intereference, the very interference that you don't want above. And yes this "rubbish" issue is just that, your rubbish, you clean it up or elect the people that will. I would not answer the letter either-Caymanians must decide,not FCO. If you guys could memorise the three areas above as being UK competence agreed with the then Caymanian reps you would begin to see who to talk to and pressure to deal with whatever issues arise. You cannot have it both ways! FCO ignores Dump protestors because FCO is getting something back, but not saying it publicly – we lose 40 million, more in debt and more Dart control. Ignored them?? ?…I did not know the FCO was that smart!! I’m not really surprised. The FCO expects the local government to govern and is respectful of the locally elected politicians and laws. This is not a matter they would consider it appropriate to comment on, and I am sure they would refer it back to the Cayman government. The Governor and the FCO expect Cayman to govern itself and not rely on the FCO except in the most dire of emergencies (natural disaster or war). So we're in a catch 22 situation. the government is too wukkless to do the right thing, and the FCO won't help us. Great. There is an election coming in May. Sort this out by electing people who will put the dump in West Bay where it belongs. Please move the dump and create a proper landfill. It will eventually burn for months with the methane stuck inside it and George Town , our cruise passengers and our air arrivals will have a nightmare. It’s not if but when. Every report written on that dump says its a time bomb. It is putting leachate into the north sound every hour. Even PPMs report said it would take 18 years and $100,000,000 to fix the EXISTING problem. And that is before our population growth over that time. What is wrong with you people. I bet you will soon hear Greg Anderson and Chuckie will be running in the elections. This is just a set up to get votes. Wake up folks and don’t miss this opportunity just because its Dart. Personally it has nothing to do with Dart. Its to do with the government following the proper processes, EIA's and surveys to establish where in the entire island is the best place to move the dump to – not to choose BT and rule out anywhere else because Mr Dart conveniently owns land there that he can swap. And also I don't think its right to keep telling everyone how this will be a much improved Waste Management Facility, when in reality the documents show that all that they're doing is the same thing in BT as they did in GT, but with the capability to be turned into a Waste Management Facility. Its up to the government to find the money to do that – and they – or rather we – haven't got any because they already wasted it on travel, perks, churches and god knows what else. The U.K. couldn't give a damn about Cayman. Hasn't this dawed on you all yet? Cayman is a bloody nuisance to a country with a less than AAA rating, truth be told. Will you please hurry and finally just get it done! I will vote for anyone who gets this done! Sick of the selfish Bodden Towners not wanting to now step up to the plate to fix this huge problem. Is it really selfish for people to object to a dump being 'dumped' on them? Or is it selfish for those who CHOSE to live near a dump to want it moved out of their back yards? In all fairness, I'd say its the latter. I always enjoyed hearing from Charles Clifford the former minister of environment when he told of his greatest regret as minister…"not bringing the conservation law before the LA." So as a dedicated environmentalist former minister Clifford must receive low marks and one must wonder if this renewed interest in the environment is politically modivated? Yes, Charles Clifford is an opportunist who always regrets not having done this or that while he was a minister, but ask yourselves, why didn't he do these things? They all left everything in sad shape for the next government to deal with. It makes me sick that he wants to now save the world and when he had the chance, he was all about him. I'm still waiting for a returned call Mr. Clifford. I can't forget all those Caymanians you fired while in office to bring in foreigners. Remember how you gave away the Houston route to Continental on Cayman Airways too? Now, Continental is making a killing on that route. Just sickening! Chuckie tried to bring it but some of his Cabinet colleagues voted against bringing it. Ask KT who voted against it !!! Thank you Mr. Clifford, Mr. Anderson and Mr. Beiner. Bodden Towners are very thankful for your efforts in protecting our health, environment and property. Where are the BT MLAs ? Whoever can move the dump gets my vote! Just get it done already! So you're not worried about education, immigration, the fact that our government has broke us, the environment or anything else. You are prepared to cast your vote based on the dump being moved only? A sad day for Cayman if there's other voters out there like you. The FCO are good for nothing. They only get involved here when its in thier direct interest to do so. They have ignored the pleas of many very worthy causes over the years. If the FCO and Foreign Affairs Committee don't listen to you (FAC are almost as useless as the FCO) – write to them again via the UK press. They'll listen to you then. Good work Chuckie and the rest of the Coalition. I hope you are successful in this endeavour but keep fighting no mattter what. All the best. I wonder how that lady in the Caymanite pink ad would look if she had on black or red, rather than green? Rule, Brittania! Britannia, rule the waves!